When my friend Monica served me Mercy Gumbo at a party a couple of weeks ago, I had no idea I would be eating something I would remember for the rest of my life. This was good gumbo- made better by its origin from the small coastal town of Venice, Louisiana that's served in a bowl with white rice and potato salad. That's right, potato salad. And if you don't combine all three, there is no sense eating it. For all you skeptics out there, I defy you to eat this and not consider it the best gumbo, ever. Monica learned the recipe the authentic way- from a fourth generation fisherman on the open sea while producing a show for the Discovery Channel. Waylon Buras (bottom left) is Captain of the Miss Carmine. Chookie (in top pic with Monica) is his longtime friend and deckhand. While on the shoot, word got out that Waylon could cook. Monica was lucky enough to feast on many of his freshly caught, shellfish delights throughout the shoot, including shrimp scampi, shrimp wrapped in bacon and blackened shrimp salad. But when Monica tried Waylon's Mercy Gumbo, she had a moment, sharing, "It was so good, I had 5 bowls of it." Waylon learned this recipe from his mom and over the years, he's tweaked it again and again until it was just right. Monica smartly had Waylon teach her how to make the gumbo on the boat, and now, he's been gracious enough to share it with all of us. 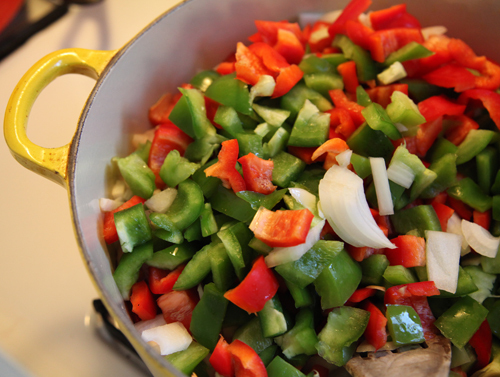 Cajun cooks prefer a dark roux for their gumbo, which offers the most depth in flavor but is also the hardest to make. Yet with rapt attention and patience, this dark, smoky roux is well worth the effort. To make, heat up 3/4 cup vegetable oil on medium low in a cast iron skillet. Sprinkle 1 cup of flour over it, turn the heat up to medium and start mixing the oil and flour together until it gets dark. If it seems like the roux is getting too dark too fast, lift the frying pan off the heat, stir some more and set it down. Keep stirring and do not walk away - if it burns even the tiniest bit, you need to throw it out and start over. Stir until it is a rich brown color, much like dark chocolate and about the consistency of peanut butter. Allow 30-40 minutes. Set aside. Heat up olive oil in a large pan, then add in all the chopped vegetables and the seasonings. Crank the fire up and keep stirring. 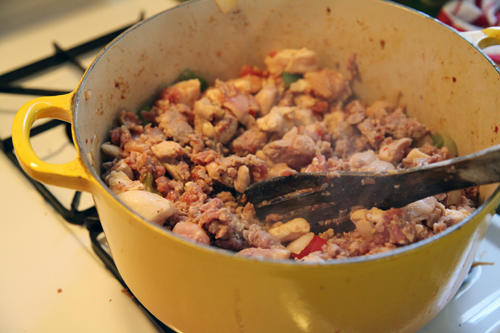 When the onions soften, throw in the chicken and sausage. Keep the fire cranked up and keep on stirring steadily. If the mixture looks dry, add a little bit of water but not so much that everything is floating. Once the chicken looks cooked on both sides, but not all the way through, add a little bit of the roux and keep stirring. Once the sauce gets thick like gravy, add in hot water. Start mixing it all together and keep adding roux and water until the roux is gone and it's the consistency that you like. 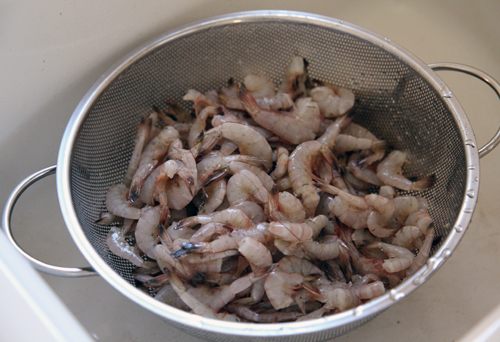 While your gumbo is simmering, peel and add the shrimp. Next, add the can of tomatoes, (this is optional). Turn the heat down and keep it on low boil for about an hour or up to a few hours. To properly serve Mercy Gumbo, place a scoop of cooked white rice in a bowl, a scoop of gumbo over that and a scoop of potato salad on top. **When ordering your wild-caught Gulf shrimp, medium size is best. Ideally you want 31/35 or 36/40. This number is the count and it denotes how many shrimp per pound. Large (21/25) or XL (16/20) work too but cut them in half before cooking. **New blog posts will resume Monday, January 6.